THE WRITING BUDDHA - Opinions | Books | Movies: The Eight FBian hearts by Harsha Shastry (Book Review-2.5*/5) !!! 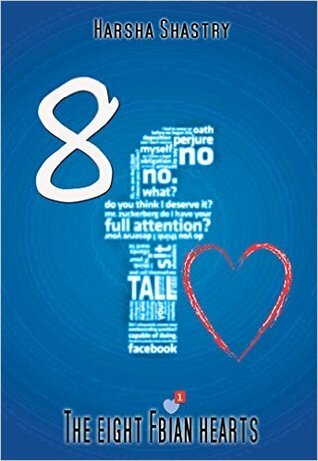 The Eight FBian hearts by Harsha Shastry (Book Review-2.5*/5) !!! I rarely read e-books because I hate the concept of getting my electronic device battery drained down at the moment when the most exciting scene would be on. Let people say anything about the evolution of e-book and slow death of paperback versions but I'll still prefer the latter. But some time, I do read e-books because one has to flow with time otherwise you would never know when the world changed and you left enough behind to match the steps with the generation again. :-) This time I read the kindle version of " The Eight Fbian Hearts" written by the debutante- Harsha Shastry. It's paperback version is also going to be released soon but the author insisted me to go with the e-book so I obliged. You should never break heart of an author because you do not know in which book of his he might kill you in the climax. Haha! Harsha's writing style is simple and it will basically attract the readers between the age group 15-22. This book will serve as an interest for the people who have just got down in the habit of reading as it's written in a language that will make people interested to read more books. Anyone who's an ardent reader won't like this book because of it's simplicity but it's a good pick-up for new readers. Yes, too many characters might lead to complexity in terms of remembering the names but with every page, the way author have dealt with characterization even the book is very short is commendable; and it will make you remember the character and their names easily. This book is kind of novella where the story is written with a message and not in terms of engaging readers for a long time. Harsha have tried speaking about many issues and reality that we, in India, face through the four different stories. The book is written with good intention. Coming to the drawbacks- I felt that the author made things look too easy and therefore, a reader might not absorb the stories as realities or something which can really bring change. Even few love stories starts so easily that you will laugh at the facts of the simplicity. Even the kind of conversations the characters have between them even in their first calls is unbelievable. Such things take place in a good story after 100 pages but here it starts as soon as the introduction of the characters get over. Author will have to learn to make things look real when he writes next time. This book is basically for the new readers and between the age group: 15 to 22. I rate this book as an average attempt with 2.5 stars out of 5.